What are Splunk Apps and Add-ons? What's the difference? If you're still confused... it's not just you. The confusion roots back to fundamental disagreements on approach that are encoded into every product the company has ever shipped, so it's tough to recommend a meaningful change. Splunk apps are folders in $SPLUNK_HOME/etc/apps. They're containers that you put splunk objects into. You can put anything in them: code, knowledge management configuration, dashboard elements, libraries, binaries, images, whatever. If you just want to put some stuff together and run it on your laptop, you're done at this point. Put things in a folder for organization. Or don't. Whatever. If you want to distribute components in a large environment, if you want to depend on shared components, if you want to avoid huge multi-function monoliths, then you start dividing apps into different types. This is why you see the terms "App" and "Add-on" in Splunk. The App refers to the visible front-end app that a user will interact with. The Add-on refers to administrator-only components. This is where the Splexicon definitions start and stop. This includes and configures data collection inputs only. In practice, these are rare and the functionality is usually stuffed into a TA. This includes and configures knowledge management objects. In practice, many TA's also include data collection inputs. A TA would be able to translate the field names provided by a vendor to field names expected by your users, as well as recognizing and tagging specific event types. This includes supporting libraries and searches needed to manage a class of data. Let's say we're building a security monitor and considering whether authentication attempts seem malicious or not. An SA could include lookup and summary generators to normalize and aggregate the data from many authentication systems and ask generic questions for reporting and alerting. 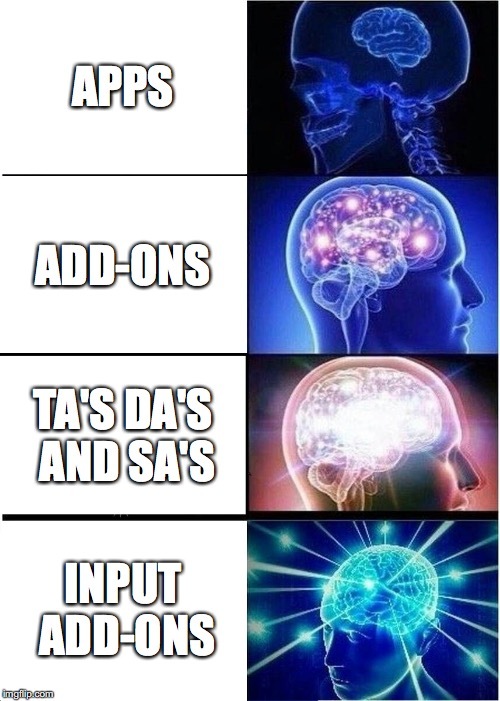 Some SA's include all the IA stuff mentioned above. This includes supporting libraries and searches needed to manage a domain of problems. Let's say we're considering PCI requirement 4, focused on antivirus software being present, configured, and not reporting infections. A DA might include lookup and summary generators to prepare those answers, dashboards to investigate further, and correlation searches to alert on problems. And so finally, the App. The front end that ties it all together and makes it usable. If it's done well, users have no idea everything before this was ever involved. This goes on search heads only. Where's the Product in AI?